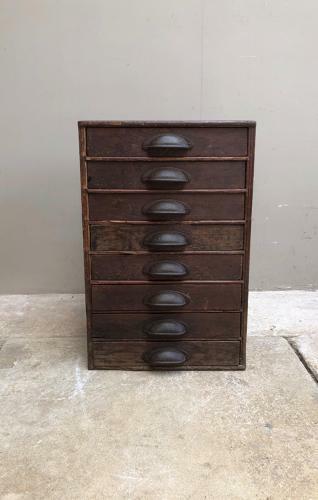 Very handy, great size, Early 20th Century Pine & Ply Flight of Eight Drawers. Has its full set of wonderful cast iron handles. Great completely original condition. Some drawers have sections inside. Four drawers down it has had a slight knock at the front but doesnt detract...all part of its charactor and age...but I always mention. No worm in the drawers or body but old long dead worm holes in the ply back panel only. This could be posted via Parcel Force 48 for £25.